Trisource Protein Blend (Soy Protein Isolate, Whey Protein Isolate, Calcium Caseinate), Cane Invert Syrup, Chocolate Flavored Coating, (Sugar, Fractionated Palm Kernel Oil, Alkalized Cocoa, Nonfat Milk, Natural Flavor), Glucose Syrup, High Oleic Canola Oil, Fructose, Water, Alkalized Cocoa, Gelatin (Beef), Nonfat Milk, And Less Than 2% Of: L-Leucine, Chocolate, Soy Lecithin, Salt, Potassium Sorbate (Perservative), Partially Defatted Peanut Flour, Ground Almonds, Natural Flavor. 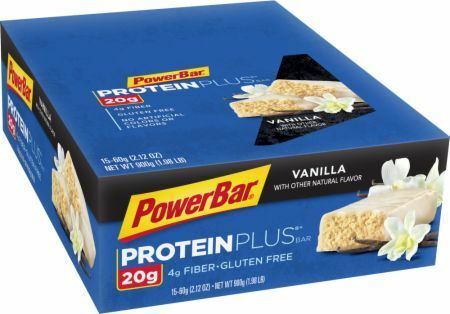 PowerBar Trisource Protein Blend (soy protein isolate, whey protein isolate, calcium caseinate), evaporated cane juice syrup, fructose, glucose syrup (from corn), sugar, canola oil, fractionted palm kernel oil, gelatin (beef), nonfat milk, alkalized cocoa, 2% or less of: l-leucine, natural flavors, soy lecithin, salt, potassium sorbate (preservative), peanut flour, almond butter. Product Supplement Facts may vary slightly among different flavors. Trisource Protein Blend (Soy Protein Isolate, Calcium Caseinate, Whey Protein Isolate), Maltitol, Chocolate Flavored Coating (Maltitol, Fractionated Palm Kernel Oil, Cocoa, Polydextrose, Sodium Caseinate, Soy Lecithin, Monoglycerides, Natural Flavor, Sucralose), Inulin, Glycerin, Cocoa, Coconut, High Oleic Canola Oil, Almond Butter, Unsweetened Chocolate, Water, Soy Lecithin, Natural Flavors. Trisource Protein Blend (Soy Protein Isolate, Calcium Caseinate, Whey Protein Isolate), Maltitol Syrup, Chocolate Flavored Coating, (Sugar, Fractionated Palm Kernel Oil, Cocoa, Whey, Nonfat Milk, Soy Lecithin, Natural Flavor), Oligofructose (From Chicory Root), Fructose, Cane Invert Syrup, Soy Crisps, (Soy Protein Isolate, Rice Flour, Barley Malt Extract, Salt), Alkalized Cocoa Powder, Water, High Oleic Canola Oil, Soy Lecithin, Ground Almonds, Partially Defatted Peanut Flour, Natural Flavor. Trisource™ Protein Blend (Soy Protein Isolate, Whey Protein Isolate, Calcium Caseinate), Chocolate Flavored Coating (Sugar, Fractionated Palm Kernel Oil, Alkalized Cocoa, Soy Lecithin, Nonfat Milk, Natural Flavor), Glucose Syrup, Cane Invert Syrup, Fructose Syrup, Soy Crisps (Soy Protein Isolate, Tapioca Starch, Salt), Soy Nuts, Whole Oats (Contains Wheat), High Oleic Canola Oil, Alkalized Cocoa, Vegetable Glycerin, and Less Than 2% of: Soy Lecithin, Ground Almonds, Nonfat Milk, Natural Flavor. Trisource Protein Blend (Soy Protein Isolate, Calcium Caseinate, Whey Protein Isolate), Maltitol Syrup, Chocolate Flavored Coating, (Sugar, Fractionated Palm Kernel Oil, Cocoa, Whey, Nonfat Milk, Soy Lecithin, Natural Flavor), Oligofructose (From Chicory Root), Fructose, Water, Cane Invert Syrup, Peanut Butter, Partially Defatted Peanut Flour, Soy Crisps (Soy Protein Isolate, Rice Flour, Barley Malt Extract, Salt), Peanut Oil, And Less Than 2% Of: Salt, Ground Almonds, Natural Flavor, Soy Lecithin, Butter (Cream). Trisource Protein Blend (Soy Protein Isolate, Calcium Caseinate, Whey Protein Isolate), Maltitol Syrup, Chocolate Flavored Coating, (Sugar, Fractionated Palm Kernel Oil, Cocoa, Whey, Nonfat Milk, Soy Lecithin, Natural Flavor), Oligofructose (From Chicory Root), Fructose, Cane Invert Syrup, Cookie Bits, (Rice Flour, Sugar, Canola Oil, Cocoa, Rice Starch, Baking Soda, Salt), High Oleic Cacnola Oil, And Less Than 2% Of: Soy Lecithin, Ground Almonds, Partially Defatted Peanut Flour, Natural Cream Flavor With Other Natural Flavor. TRISOURCE PROTEIN BLEND (SOY PROTEIN ISOLATE, CALCIUM CASEINATE, WHEY PROTEIN ISOLATE), MALTITOL, YOGURT COATING (MALTITOL, PALM KERNEL OIL, YOGURT POWDER (CULTURED WHEY PROTEIN CONCENTRATE AND CULTURED SKIM MILK), NONFAT DRY MILK SOLIDS, SOY LECITHIN, SALT, NATURAL FLAVOR), CHICORY ROOT SYRUP, ALMOND BUTTER, CANOLA OIL, SOY LECITHIN, WATER, NONFAT MILK, POPPY SEEDS, LEMON, NATURAL FLAVORS, CITRIC ACID, SUCRALOSE. Trisource™ Protein Blend (Soy Protein Isolate, Whey Protein Isolate, Calcium Caseinate), Coating (Sugar, Fractionated Palm Kernel Oil, Whey, Nonfat Milk, Cultured Whey, Soy Lecithin, Natural Flavor), Fructose Syrup, Glucose Syrup, Cane Invert Syrup, Soy Crisps (Soy Protein Isolate, Tapioca Starch, Salt), Whole Oats (Contains Wheat), Peanut Butter, Roasted Peanuts, Peanut Oil, and Less Than 2% of: Vegetable Glycerin, Nonfat Milk, Soy Lecithin, Salt, Natural Flavor, Butter (Cream). Trisource Protein Blend (Soy Protein Isolate, Calcium Caseinate, Whey Protein Isolate), Maltitol Syrup, Coating, (Sugar, Fractionated Palm Kernel Oil, Whey, Nonfat Milk, Cultured Whey, Soy Lecithin, Natural Flavor), Oligofructose (From Chicory Root), Fructose, Nonfat Milk, Cane Invert Syrup, Water, High Oleic Canola Oil, And Less Than 2% Of: Soy Lecithin, Grounds Almonds, Partially Defatted Peanut Flour, Natural Flavor. You train hard, make it count. PowerBar Protein Plus bar has a TriSource protein blend to help build lean muscle and provides sustained energy for active people. Take PowerBar Protein Plus bars after training or competition where protein intake has been shown to help promote muscle recovery. this bar contains 20g of TriSource protein, a proprietary blend of whey, soy and casein proteins that provides muscle-building amino acids. This new powerhouse hits your sweet spot. Reformulated to give you exactly what you're looking for, the bars have a lighter, fluffier texture. Designed to be used before or after a workout to help build lean muscle, provide sustained energy and as a convenient source of high-quality protein to add to an overall diet.